The stunning and beautifully restored chateau is located in the Morvan hills in Burgundy, on the doorstep of the vineyards of the Côte d’Or, an hour south of Dijon. 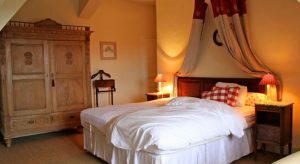 The chateau is set on a 500 hectare estate in which the owners have created a wildlife habitat which is unique in Burgundy and with beautiful views across the Burgundy countryside. Stay in the warmer summer months and enjoy a game or two of tennis followed by a cooling dip in the chateau’s swimming pool. 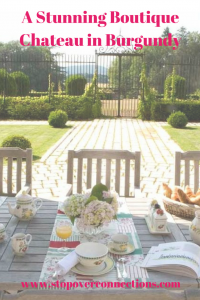 Enjoy breakfast in the peaceful courtyard before heading out to explore the many footpaths that surround the chateau estate. 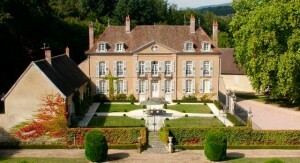 The owners of this private and stylish family chateau are passionate about the food and wine of Burgundy. Experience superb cheese and wine platters or full blown gastronomic evening meals created from local and seasonal Burgundy produce. Local Burgundy wine will naturally be on the dinner table, especially selected from the owners’ wine cellars. The guest rooms at the chateau are luxuriously furnished with supremely comfortable beds. Only the finest bed linen has been used along with beautiful fabrics and tasteful colour schemes. Fine pieces of period furniture and all those extra little details lift this beautiful chateau in Burgundy up into the boutique category. If you’re organising a special celebration or simply have the urge to treat your significant other to a romantic break in Burgundy, this luxury chateau really is the perfect choice.